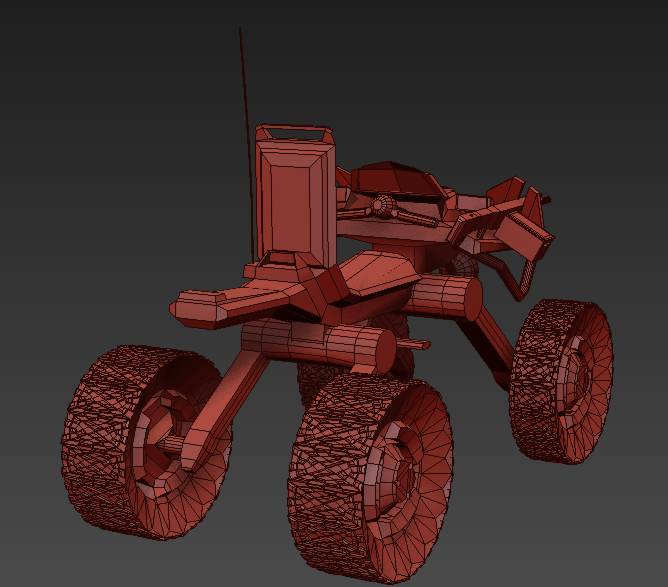 »Forums Index »Halo Custom Edition (Bungie/Gearbox) »Halo CE General Discussion »What do people think of these vehicles I'm making? I've got a couple of custom made models, and I'm curious as to peoples thoughts on them as they have some heavy redesigns... seriously, I make 343 look faithful in terms of design. I will also add more from time to time as they are made. @Thatguywholikescats Oh, sorry, where should I have posted this? Also, @spartan 314, "also these"? What do you mean? Instead of linking your deviantart I img tagged the image on there. It's easier because people don't have to leave the forum to get the image information. The warthog redesign actually looks pretty cool! Although I think it should be classified as a new vehicle entirely. The reason I'm not reclassifying it is that it serves the exact same purpose as the Warthog, thus it's simpler and more intuitive to just call it a Warthog. Unless you mean't something like M13 Warthog instead of M12... in which case that isn't a bad idea. EDIT: I just uploaded an image of another warthog variant, the last hog type I currently have planned. It just a cosmetic medical hog though, essentially a Troop Transport with stretchers in the back. EDIT 2: Added a mongoose to the site. Also, booya. Figured out how to post pictures. I'm also putting the picture of the scorpion I made down here, as @spartan314 missed it. Any suggestions on how to improve them? Lol simple bevels don't qualify as tire tread. 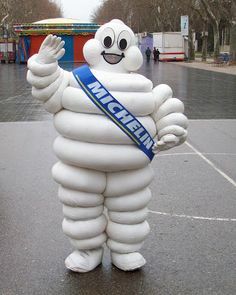 Just ask the michelin man. Decent models though, not amazing but a good start. Btw I highly suggest you research up on vehicle mechanics, how things are built and why, take a note of specific functions and uses too. Your current tank sends mixed signals in regards to scale: it's lulzily wide, but the vertical profile appears almost smushed. Given the size of the cannons compared to the commander's MG on the roof, it's on-par with WWI-era landships in terms of excess. That being said, I do like that you've attempted a UNSC tank with a conventional configuration as opposed to the quad tread bogeys typical of the mainline Scorpions. 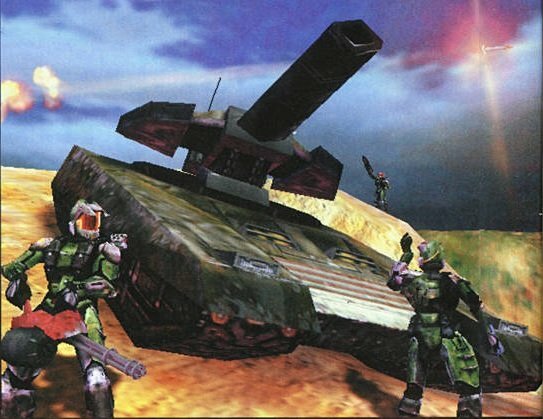 I would suggest looking at the pre-Xbox Halo "stealth tank" as a reference; it's similar to what you seem to have been aiming for, but with proportions and an armament better-suited to an MBT (although it could stand the addition of a coaxial MG). Although you gotta admit it wouldn't look half bad if he added treads and unfugged the bottom hull. 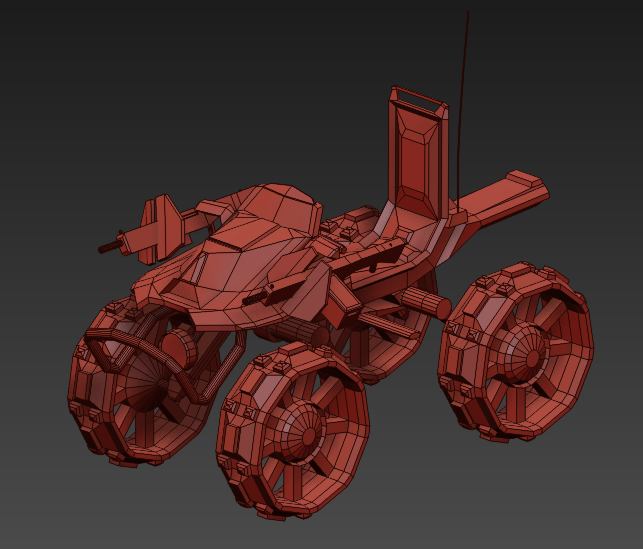 e: And removed some of that dakka, or at least standardized it. More isn't always better lol, having barrels of varying size and length jacking out doesn't do the model any services. Yeah, if it was slimmed down, the hull was modified, and the little cupola up front was moved to the roof, it probably wouldn't look half bad. I'm not sure how Halo-ish it would be, though. The 90-degree face of the turret calls back to things like the German Tiger. @Echo77 Well, the disproportionate size of a 25cm cannon to a 7.62mm MG is to be expected, the original deviantart page has more information, but essentially, the concept is the scorpion needed to be heavily upgraded to fight the covenant, such as adding an EMP device to the shell and since I'm planning on adding shields to wraiths (assuming that's possible in engine,) that device is necessary. Hence why a I nicknamed it the Jumbo. I mainly did this because, one, 25cm cannon and two my normal models didn't look right to me. 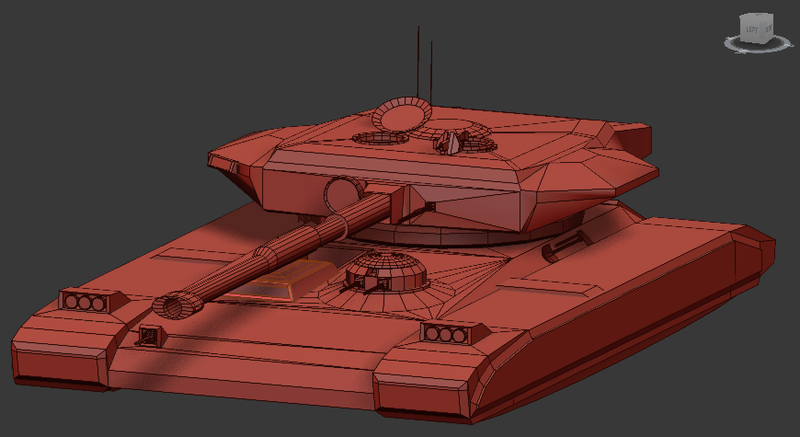 The oddly wide design was me trying to make the scorpion more practical as an MBT, while attempt to keep the feel of the tank the same. Still I see your point, perhaps I should fix the proportions and use the concept for a grizzly or something, and make a more traditional Scorpion. Also, thanks for the stealth tank, hadn't heard of that before. EDIT: If I were to move that gun to the roof, I'd be worried about balance. That's supposed to be a REALLY big machine gun. If it was just a single 250mm cannon, it'd be doable. You'd have yourself a nice SPG or something. But a 250, 140, and dual 76mm autocannons isn't a practical upgrade. There have been tanks that attemped multiple turrets and/or cannons in the past, and they died off relatively quickly when people realized it wasn't as beneficial as they expected (which is why you pretty much stop seeing them by mid-WWII). True, though I believe the issue with multiple turrets actually came from the commanders ability to effectively lead such a tank, as well as man power, it wasn't necessarily an engineering issue. Still, your point remains, I'll replace the 140 and the 76's both with a couple of 14.7mm MGs. 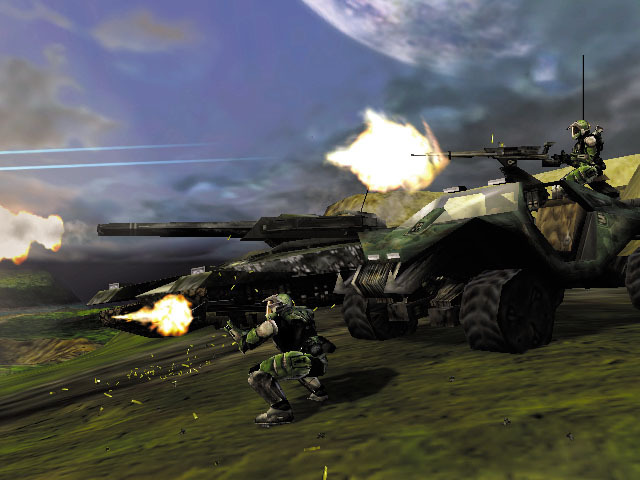 BTW, any idea what role the stealth tank was to serve in Halo before it was cut? Also, the wide profile is a trick of the light, the treads are only as wide as the turret, though, to be fair, that's still quite wide. The bits around the sides of the tank just don't seem right. But it's getting much better. I brought those bits in a little, does that work better? 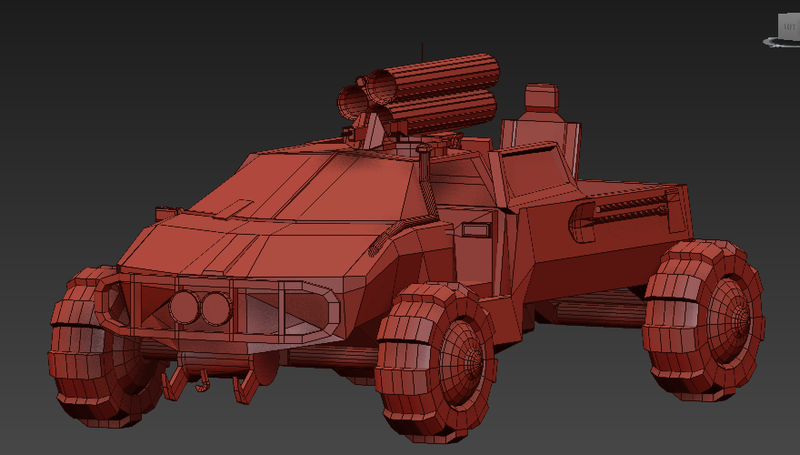 I added the turret to my test version, and not the main version, so the body has a few misc differences I'm trying out. They're mostly hidden by the camera angle though. 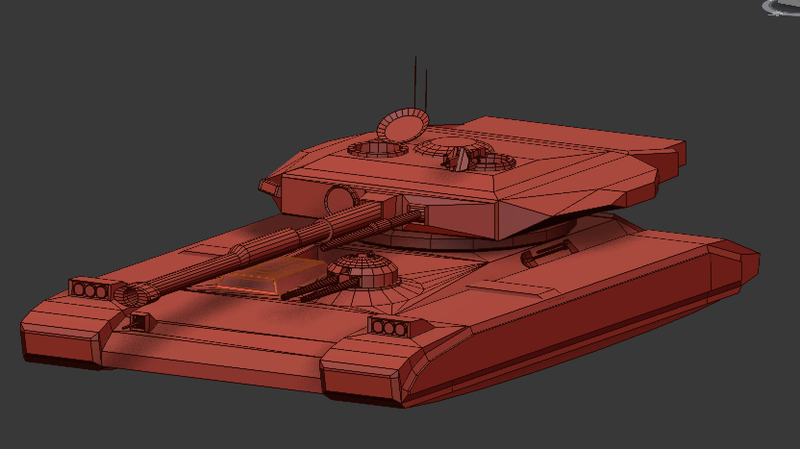 The mongoose and Scorpion also look really cool, and yes, stealth tank inspiration pls. Pre Xbox influence is good. In terms of naming the warthog, maybe consider it an older model, as I'd say the OG design would probably be more sturdy. I made some changes to the goose. 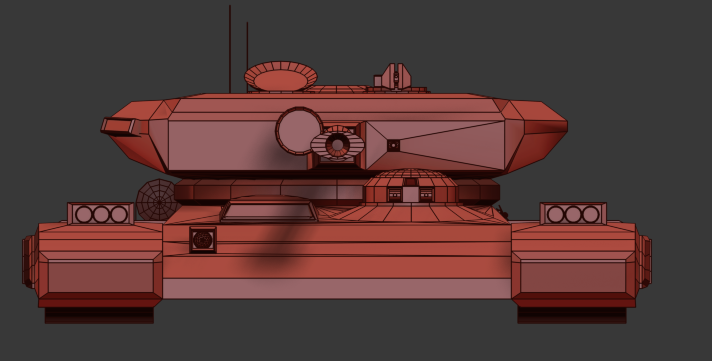 It seems like it was intended to serve as an MBT, with the "stealth" aspect coming from the angular design of the hull (probably intended to interfere with radar signature). The apparent backblast shown in some images of the stealth tank firing its main weapon leads me to believe that it's equipped with some sort of anti-tank missile launcher, as opposed to a conventional cannon. 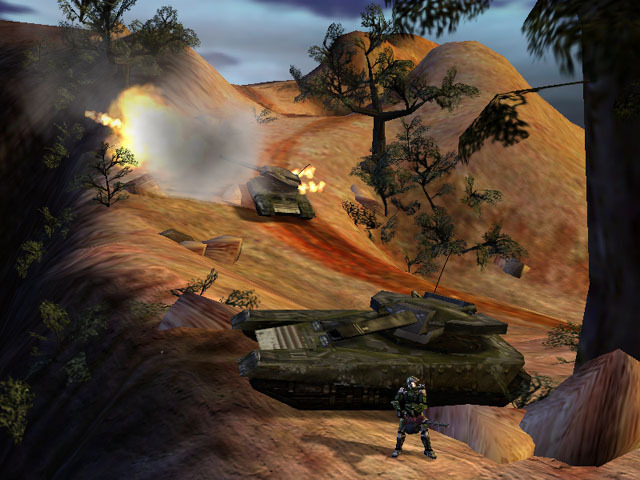 In terms of in-game performance/functionality, one possible approach could be to treat it as a heavier-hitting counterpart to the Scorpion: firing a slower projectile with a larger explosive payload, and sporting additional armor at the cost of speed. I believe it would also be possible to reduce the motion tracker blip to the size of a Spartan's, although it's been a while since I've looked. You could also take the opposite route and try to emphasize the "stealth" aspect. Make it lighter and faster than the Scorpion. Reduced armor to provide an incentive to slip into position, fire, and displace before you can be located. Swap the slow-moving, high-explosive missile with a quicker, guided projectile with a reduced blast radius. Ditch the coaxial MG and force the driver to rely on support from teammates or a passenger down in the hull. 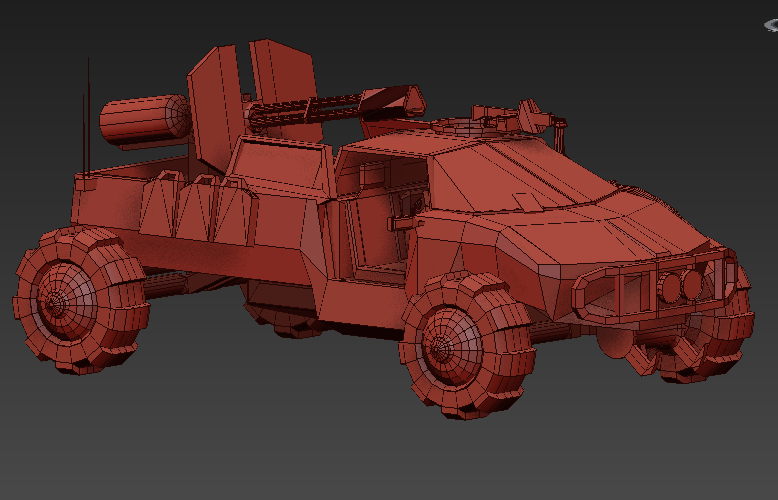 It would be in the front, though, unlike the warthog and scorpion, it isn't modeled or anything. EDIT: This is just a concept at the moment, but would it be possible to add boats to Halo 1 for naval battles? Yes, it involved using the Ghost's physics and modifying the water friction values. Can't recall exactly how off-hand however. Are there any custom maps already released that feature this, so I can test it out? I like the Mongoose, but it definitely has issues. Your other vehicles are too wide-looking, but the Mongoose is slightly too narrow, I think. Where is the engine? And I'm certain those wheel struts would break quickly, and the axles too. Also, terrible tire treads. I can tell you just extrude blocks that you feel like. Make some realistic tire treads, add an engine and strengthen the struts. I strengthened the suspension struts and added a modelled battery under the bonnet. (Yes, I've decided it's electric.) 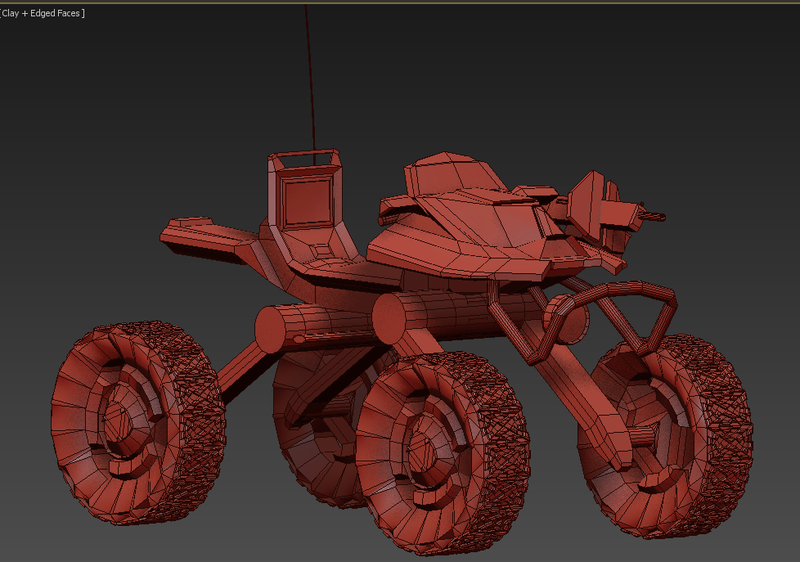 I also overhauled the tire treads, but now I'm worried about poly count, and I'm considering flattening it out and using textures for it instead, similar to how such details were achieved in H2. Looks better, though I think the tires themselves look too thin. If you're going electric, maybe you can have the engines integrated in the rims (like oversized brake discs). A booty render would be good too. 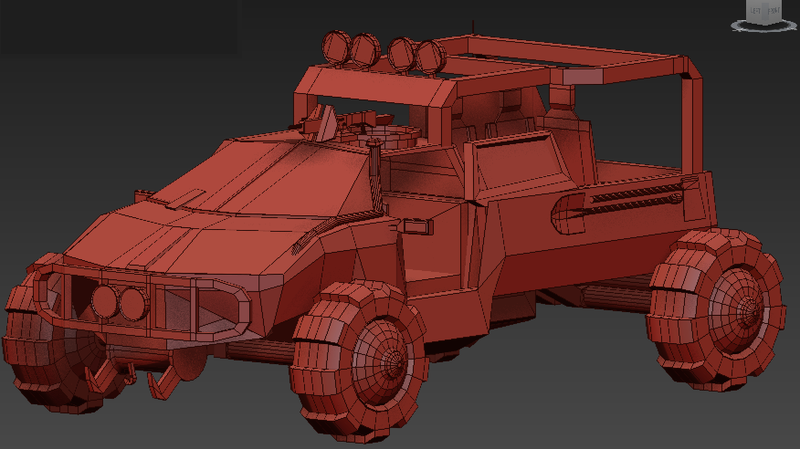 I thickened out the tires. I also liked the engines in the rims idea, and to house said engines I expanded the wheels to be larger. Also, back shot. It's a bit plain at the moment though. EDIT: I took a look at Hydrolysis, the boats worked quite nicely... except they worked on land. Would there be anyway to prevent this short of forcing the player out of the vehicle when it gets onto land? No offence but it looks like a hot wheels toy. Your should probably round out the outer perimeter of your wheels using a chamfer or two, right now that concave look, looks super awkward. The backrest is a tad obnoxious too, especially when you consider the grab handle is so low which means the passenger will most likely be on his knees whilst trying to fire at enemies. I'd lose the GPMG's altogether but I guess you could maybe keep one for offensive use. Having two means the driver would have to let go of the throttle and brake in order to use them unless the triggers are actuated by a smart link system. All in all I'd recommend you brush up on the basics of vehicle mechanics, just to give you a better idea of how parts should correlate together and whatnot. Any sites I should check out to help me get to know vehicles better, cause your right, I don't know much about vehicle mechanics. I can get the back rest thing, I did that in an attempt to increase it's profile a little bit, but I was a little undecided on whether it looked good or not. I'd love to see all of these in a custom map. Good luck with what you're doing. I've lowered the seat, removed the right mg and rounded out the tires a little. Generally mashing a up a folder of image references is another way to garner some appropriate inspiration if you are struggling for design ideas. 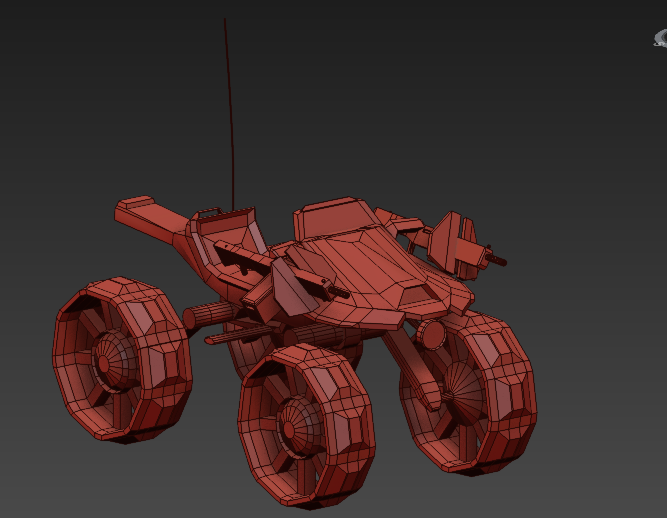 Or maybe import one or two of the original halo models such as the H3-HR mongoose/warthog and study the designs a little more to get a feel for your creation. Time: Fri April 19, 2019 3:26 AM 282 ms.